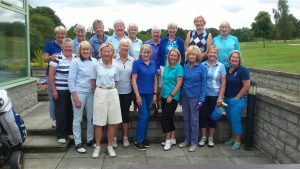 The extra August Medal prize; The Miss Designer Golf Jacket, was won by Gill Kelleher in a very close card inward 6 result. Well done, Gill. 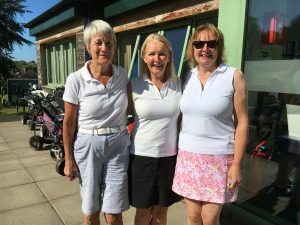 Putting Competition – Gwen Gray Ratho Park GC & Susan Wotherspoon Ratho Park GC 35-2 cms. The charity raffle for “Mary’s Meals” and “The Singing Group” raised £426-32, thank you for your donations and your support. 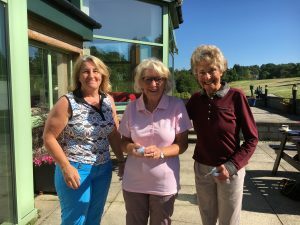 Congratulations to Yvonne who got a Hole in One at the 5th. 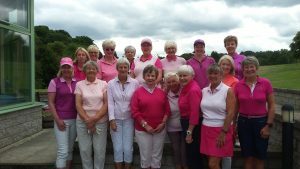 The biggest winner was Breast Cancer Fund Raising – well done to all. 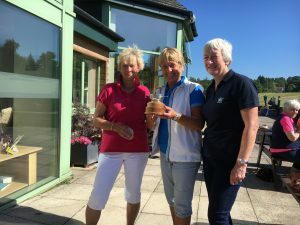 Burntisland Outing winning team; Alison Clark, Susan Gardiner and Ruth Miller. 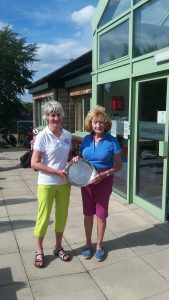 Susan was also the individual winner of the Dot Liddel Tropy. Lady Captain’s Team had a resounding victory !! 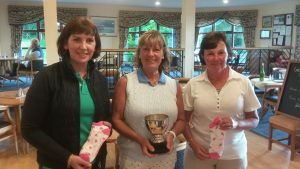 Blair Salver Winners, Margaret Allen and Shona Moreland.